Extended Foot Joint for Low Flutes: These are nice - but these are no longer available. They are simply too much work! December 2004 - In response to the popularity of both Casey's low Bb and A designs, he is now offering a low flute combination package. Please see the low flute catalog page for details. July 2004 - A nice combination of recent orders and shop timing allowed us to take photos of several curly boxwood flutes together, along with an example of a cant or half-log from which the flutes are made. Please see the photos and read more about this beautiful wood on our Wood selection page. 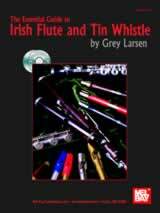 November 2003 - We are delighted to offer for sale the comprehensive and authoritative new book by our friend Grey Larsen, The Essential Guide to Irish Flute and Tin Whistle. In addition to being recognized as an American master of the Irish flute, Grey is an excellent teacher and proponent of the instrument. We recommend The Essential Guide (known affectionately by some here as "Grey's Anatomy") without reservation to flute and whistle players of all abilities. "Grey writes with great clarity, saying the most in the fewest words possible. This is the most important work on the traditional flute to appear in over 150 years." In fact we believe so strongly in the importance of this book that we are promoting it through direct sales on this site as a convenience to our flute customers. Please visit the book page for more details on the book, and to view its Table of Contents. November 2003 - Casey is offering a new flute model, the Low Bb Ergonomic Rudall. Combining judicious ergonomic adaptations with impeccable voicing, this new low flute speaks with no more effort (though just a little bit more wind) than a D Rudall. An economical configuration is offered which puts this unique flute voice in the reach of most players. For detail photos and more information, please visit the catalog page. "It plays beautifully: intonation is excellent, response is really good, the tone is wonderful, and it is very comfortable to play. I give it two thumbs up." November 2003 - Casey Burns Flutes produces a 3 piece wooden flute with great tone and intonation, designed for beginners: nothing more, but nothing less. A solid and correct traditional instrument, one need not suffer frustration practicing at home or embarrassment playing at sessions. This instrument is made with the same reamers, the same wood and the same care in tuning and voicing as his more expensive models. It is offered as his "loss leader" in order to get an excellent flute into the hands of as many players as possible. Please visit the catalog page dedicated to the Folk Flute.